Nowadays, if you want to start a healthier and more active lifestyle, you can simply download a mobile app. There are thousands of them – they count your steps and hours of sleep, track changes in your body weight or calorie intake, as well as recommend what to eat or which exercise to do. Fitness trackers, smartwatches, and other wearables help people to keep track of their health. However, innovations in healthcare went even further. AI solutions help doctors to diagnose an illness at an early stage and prescribe individual treatment. 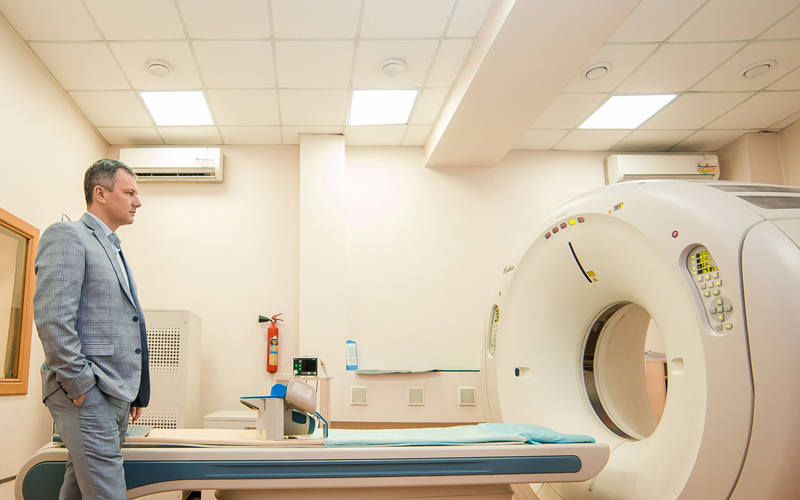 Various healthcare devices enable patients suffering from complex diseases to enjoy a normal life, and doctors – to make the right decisions regarding the treatment. GlobalLogic has been developing various complexity healthcare projects for 17 years already. 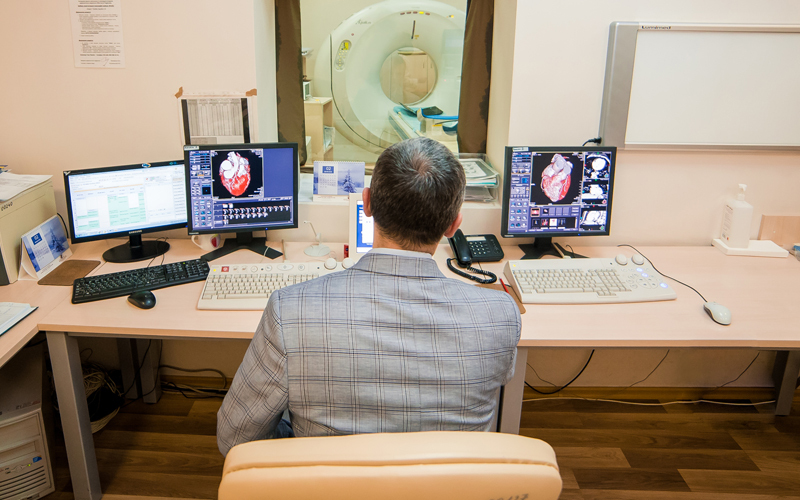 Over 300 Lviv-based engineers are engaged in developing healthcare products and systems. Starting from an idea and ending up with workshops for medical staff on how to use specific devices. 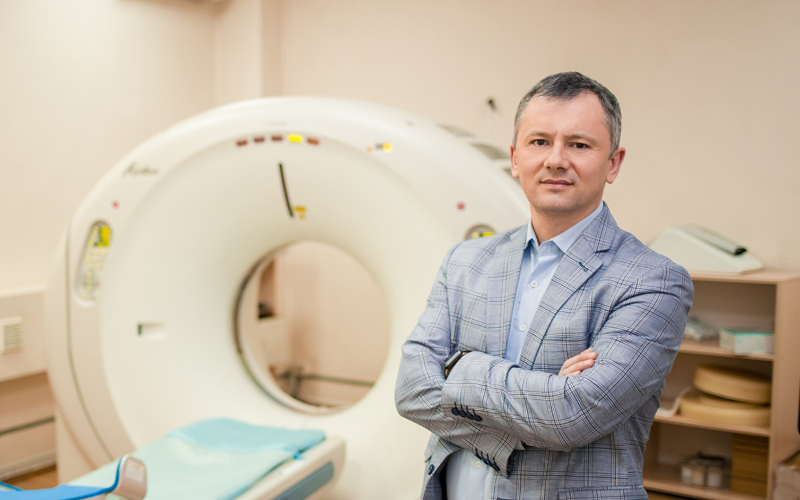 Ihor Kostiv, an experienced IT professional, is leading a few important healthcare projects of the company. 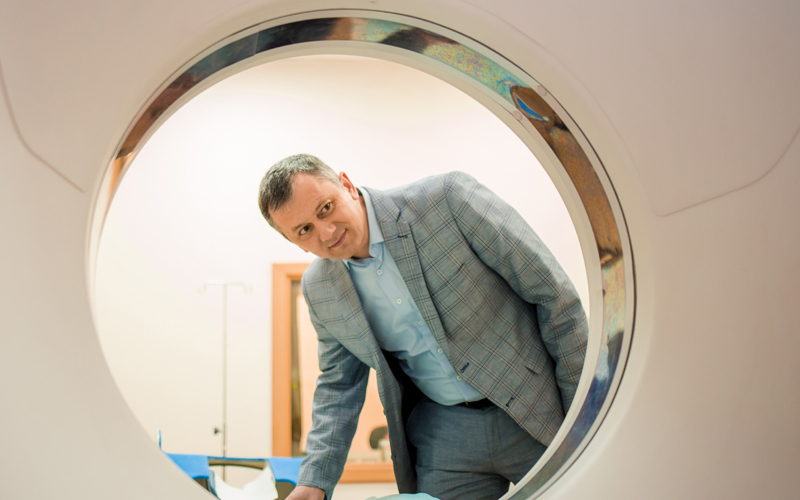 For ITID Lviv, he reveals the secrets of the industry, telling about the life-saving devices developed by local engineers and medicine of the future. It’s natural that people take care of their health and want to live longer. If there is a demand, there will always be a supply. Especially now, with IT developing rapidly, this offer has received a powerful push. Modern people don’t just take meds – they value a system approach to health, and at present technologies can only make it more effective. Usually, patients contact a doctor when they are already sick. Therefore, a doctor makes a diagnosis when the illness is already at a certain stage. Thanks to IT solutions, we can with a certain probability predict which disease a specific person might get in the future. This way, it’s possible to prevent, for example, endocrine or cardiovascular diseases, which are the most common causes of death in the world. It’s more complicated to recognize such diseases, but still, possible. However, since modern smartwatches usually track just one parameter, the disease would still be recognized at a certain stage. Right now, innovative technologies are developing very fast, and there are already prototypes of smartwatches which can measure blood sugar levels, so-called cardio bracelets, etc. IT solutions improve medicine, make it more effective. Thanks to technologies, many patients can be treated without any medications, just by changing the lifestyle. Almost all endocrine diseases can be cured simply by cutting down on junk food and alcohol and starting to exercise. It’s the same with cardiovascular diseases. You can prevent them by starting a healthier lifestyle. Nowadays, there are plenty of mobile apps, which encourage people to quit smoking, do more sports, drink more water, etc. Often such apps offer some gamification elements to motivate users by giving them bonuses. This approach is already working and it is quite popular. Technologies are already moving the main focus of healthcare to preventive medicine, from treating diseases to preventing them. Artificial Intelligence opens up phenomenal opportunities for diagnosing diseases. Thanks to AI we can identify a disorder at an early stage – algorithms are more attentive to details than just a human eye. An AI system can make recommendations for a treatment based on terabytes of analyzed data. It doesn’t mean that AI is better than a doctor, however, it does help. For now, the final decision is still up to a human. If a doctor prescribes certain drugs to a patient, it is important to understand how they will affect the patient’s body, can they be combined with other medicine, can they cause allergies, etc. The human body is an entire system not similar to others, and so is the response of every individual to any particular medication. Yes, an AI system can learn to recommend specific pills to patients with specific symptoms, but there are things during any treatment that can only be observed by a human. The human brain is still better than AI, it’s more flexible and able to react smarter to unpredictable situations. As a rule, medical devices are assigned to one of three regulatory classes – Class I, Class II and Class III. Class I includes basic mobile apps that can’t harm people’s health. Class II – programs which help doctors to make certain decisions: they provide extra information, highlighting the most important points for a doctor not to miss anything. Class III encompasses programs or devices which directly affect human’s health, they are in contact with a patient, are responsible for administering drugs into the body or directly administer them. GlobalLogic is engaged in all types of projects including Class III. One of the projects GlobalLogic is contributing to — digital solutions for implants which helping people who don’t hear high-frequency sounds. Another great project GlobalLogic team participated in was a head-mounted device for anesthesiologists. It is a portable display designed specifically to help healthcare professionals monitor patients’ life indicators during a surgery more efficiently. The device prototype was created as ergonomic, lightweight and innovation display with the unique graphical interface. When I travel or go on business trips, I always pay attention to defibrillators at airports – our company has contributed to software development of these devices. Modern devices allow people without a medical degree and training to do defibrillation. Step by step, the system tells what has to be done, it makes the diagnostics itself and calculates the required dose of electric current. Another project Lviv office of GlobalLogic is proud to be involved in – a device for esthetic medicine geneO+ for Pollogen. This portable device provides three-component skin care: soft peeling, skin nourishment, and oxygen saturation to stimulate collagen formation. Our engineers have been developing the user interface for this product for six months, and in a year, the client has released the product on the market and sold more than a thousand devices. Medicine is a very knowledge-intensive field, and in order to understand, study, and then solve a certain problem, we focus on a particular area and become experts in it. When it comes to healthcare devices, usually, after the first generation is released, we start working on its improvement and then release the second and even the third one. Design, techniques, treatment methods are constantly being improved. Overall, we provide full cycle development of healthcare products – from the very idea to a software ecosystem, often including all user documentation and training sessions for end users. After a device is released, it is tested for a certain period of time. Devices are used in clinics and doctors provide feedback and recommendations. Only then, a product goes to the market. Healthcare products are released only with zero non-conformities. Any observation initiates new release cycle testing processes. In addition, GlobalLogic contributes to the development of Machine Learning and AI systems. Training AI for specific tasks usually requires huge amounts of data. We work with various types of data: open-source data, depersonalized protected data, client-specific data on premises. Due to legal constraints of data usage, we prove all security and control measures within such products. Our engineers are trained to work in such specific environment. As a result, we have developed software models that make suggestions in various healthcare domains. To work on healthcare projects, you have to learn and research a lot. Before we offer our client a solution, we conduct technology investigations and validations. Predominantly, we are an R&D office with scientists and engineers developing embedded software for our projects. GlobalLogic has successfully acquired an ISO 13485 certification of our quality management system. Moreover, the company complies IEC 62404 specifications – a series of technical standards for the safety and effectiveness of medical electrical equipment. Many software engineers are afraid to work on healthcare projects, because of a big responsibility that comes with the job. However, the development of healthcare products is based on a rigorous process that allows a person to achieve results unhurried, step by step – from the development stage, or even from simply understanding what needs to be done, to testing. Healthcare projects are also way more interesting, there is a powerful social component here. We don’t just bring profits for our clients, we change and save people’s lives. Healthcare products must work perfectly, especially the ones that directly affect a patient’s life. Therefore, we make sure every project is fully controlled at all stages. Our processes are built in a way that minimizes the possibility of a mistake. A developer gets a certain set of recommendations – what should be done and how. We have a powerful team of QA engineers who track all mistakes, and we also apply automated testing. Earlier, the process of full testing of any device would take three months and now, thanks to automated testing, we are able to get a result in three days. Every engineer is responsible for their part of work, and this is also important and effective. Before starting to work on any highly specialized healthcare project, of course, you have to learn more about the area. Sometimes it is necessary to understand how certain doctors or medications work or find out the specifics of a certain illness. When a person joins our team, in addition to professional training sessions, we also arrange meetings with experts and doctors from the niche area the project is related to. This way, all participants of a project get the expertise in a certain field, and can fully understand what they are doing and what kind of problem they are trying to solve. In addition, clients also conduct clinical studies and closely cooperate with clinics, providing us with valuable insights. Entering the world of healthcare business is expensive. Moreover, developers should not only know how to code well but also understand the subject area. We have an onboarding program for newcomers, which allows us to train new employees rather dynamically. More than 300 professionals at our Lviv office are involved in healthcare projects. In total GL office in Lviv cooperates with more than 850 experts. On average, introduction to a project takes 2 months, and then, depending on the project, it may take up to 4-6 months for engineers to reach the level of full performance in the domain. Usually, healthcare projects are long-term. One of my projects lasts for 8 years already. During this time, we released two generations of the product. This project involves a lot of science since, in addition to the usual technical nuances, one should predict the behavior of the human body and take inertia into account, etc. We get a lot of feedback from the end users on our developments. It’s great to read them and see something like – “I am but one person and there are thousands more for whom these technologies will change their lives forever”. This motivates. Once one of the patients even came to Lviv to tell the developers’ team about his user experience. It was inspiring. In the future, most of the people will be able to avoid going to a doctor. In the USA, diagnosing diseases and getting individual healthcare recommendations based on IBM Watsons Health (a question answering AI system) is already a widespread practice. If you integrate this system with your personal assistants (smartphone, computer, tablet), you won’t need to go to the hospital at all. And that’s what people really need. One of the trends of the future medicine is to make non-invasive medical measurements, without blood tests and other procedures. Painless and not scary. People often refuse to see a doctor, because they are afraid to take tests, especially blood tests, X-rays, and so on. In the USA, there is also a well-known telemedicine solution system – VSee. It is an electronic system that allows communication with a doctor and provides a set of devices for home use, including a stethoscope, otoscope, ultrasound, fluoroscope, etc. 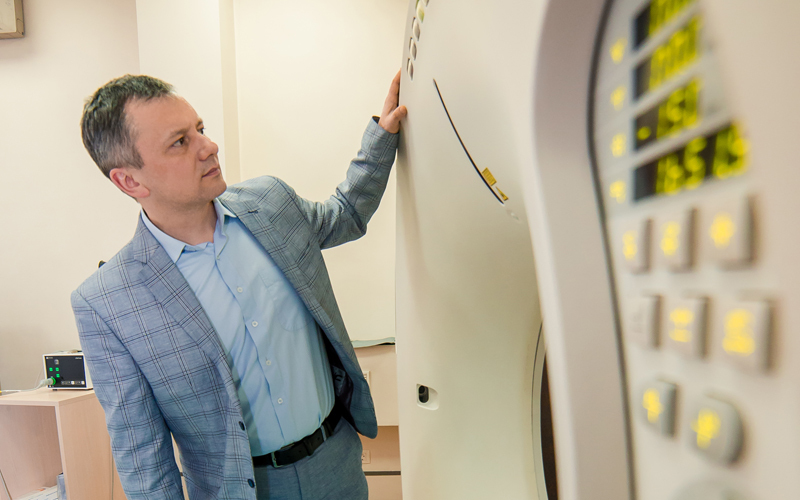 A doctor can immediately see these measurements results and diagnose a patient online. All information and test results are stored in the system and can be used later. In the meantime, human, medical professionals, and doctors will work on more complex cases – diagnoses, surgeries, and innovations. Everything that is simpler, even simple surgeries – can be automated, transferred to computers and robots. It’s already being practiced, partially. Robotic systems are already carrying out complex operations through a small cut with a minimum of incisions. Today, this is happening under human control. However, theoretically, in the future surgeries will be performed without human control at all. A few years ago, Google has developed contact lenses (Google Contact Lens) that can measure blood sugar in a non-invasive way, through tear fluid. Right now, it’s just a prototype not used on a massive scale, but the solution is very interesting. For people with diabetes, such solutions can significantly simplify life. It is also worth mentioning an interesting startup – the FORWARD clinic, listed by the TIME magazine among the top 25 innovations in 2017. The clinic operates like a gym, where a person buys a monthly subscription and regularly takes recommended tests and screenings without waiting for health problems. This approach also aims to prevent complex diseases in the future. Clinics without queues already exist in Ukraine. In any private clinic, you can make an appointment for a certain time, without having to wait in line. Clinics without doctors will also have a place in the future. The so-called telemedicine is slowly becoming a common thing: these are remote consultations with a doctor and a variety of ways how your medical data can be transferred. In the future, Artificial Intelligence will also be able to provide such consults: you will tell symptoms and get advice and recommendations from the AI system. It may look like a video call, therefore, it will seem like you are talking to a real person. Ukraine is also slowly moving towards insurance medicine. Among the latest reforms, it’s the introduction of the eHealth system. It is an electronic database of doctors and patients, through which the state will pay the doctor for each appointment, and the patient will be able to promptly receive all information about their health and test results since the data will be stored online. eHealth should start to fully operate at the end of 2018, firstly only for family doctors, physicians, and pediatricians, and later for all other doctors.